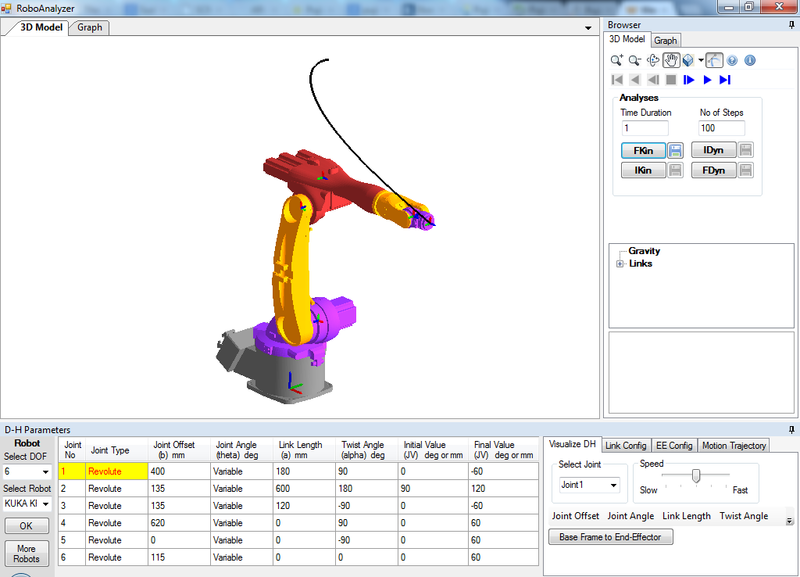 RoboAnalyzer® is a 3D model based software that can be used to teach and learn the Robotics concepts. It is an evolving product developed in Mechatronics Lab, Department of Mechanical Engineering at IIT Delhi, New Delhi, India. Its development started under the guidance of Prof. S.K. Saha in order to support the learning/teaching of the topics covered in his book "Introduction to Robotics" published by Tata McGraw Hill, New Delhi (First Edition in 2008 and Second Edition in 2014) and also brought out in Mexico (2009 in Spanish), China (2010) and Singapore (2010). Virtual Robot Module, a part of RoboAnalyzer, has been developed as an application which has joint and Cartesian motion. It has also been made as a COM server, using which one can integrate VRM with MATLAB, MS Excel and other applications that has a COM interface. It also has been integrated with Robotics Toolbox for MATLAB by Prof. Peter Corke of QUT, Australia. More details here. 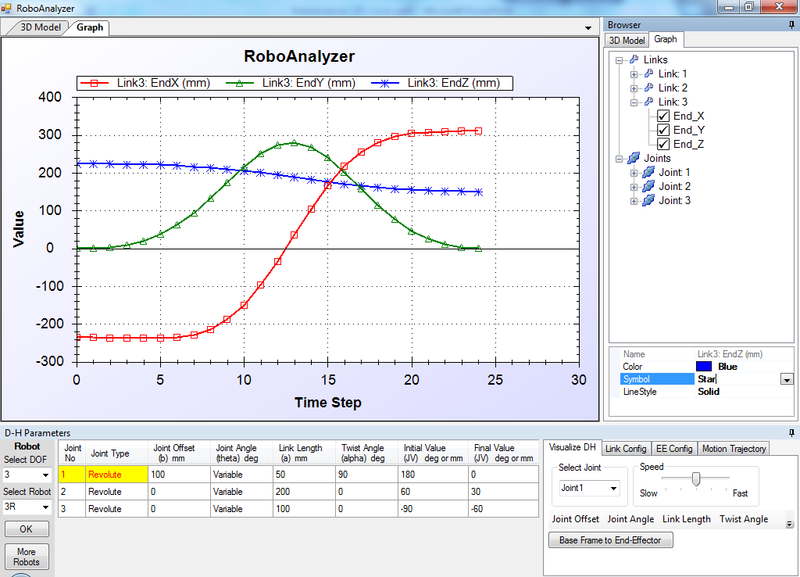 We have also prepared a set of Virtual Experiments using RoboAnalyzer, that can be used to compliment a robotics courses. More details here. 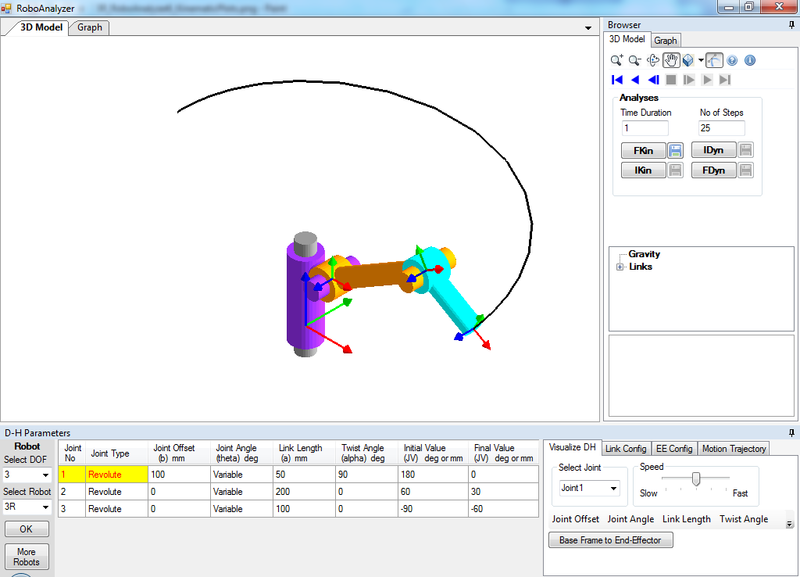 Similar to RoboAnalyzer, another software developed by us to teach and learn Mechanisms is named MechAnalyzer®. More details of MechAnalyzer. Mathematics involved in the study of robotics, e.g., forward and inverse kinematics etc. is initially difficult to understand by students and same is the case by a teacher to convey the essence of mathematics of robotics to the students. This is due to fact that, for example, forward and inverse kinematics involve 3D transformations etc. It is also to be noted that the industrial robots are represented using Denavit and Hartenberg (DH) parameters which are difficult to perceive and visualize in 3D. RoboAnalyzer aims to ease out the above difficulties for students and teachers. In essence learn/teach the physics of robotics with the joy of RoboAnalyzer animations before attempting to learn the mathematics of robots, as covered in the books of Robotics, for example, "Introduction to Robotics" by S.K.Saha. We have also developed a list of practicals/assignments based on RoboAnalyzer that can be used to complement a Robotics course. It can be downloaded from this page. We are constantly working to improve RoboAnalyzer by adding more modules and making it more effective to use and learn. Try RoboAnalyzer by downloading here. Its video tutorials can be found here. We would love to hear your valuable feedback in making RoboAnalyzer better and better. If you have any suggestions, please use this online form or send it to us.